My husband and I are currently in the process of building what will someday be a permanent residence for us in northwest Indiana. What I find so appealing about our 21 acres is that the landscape is rich with habitats that support a wide variety of birds. 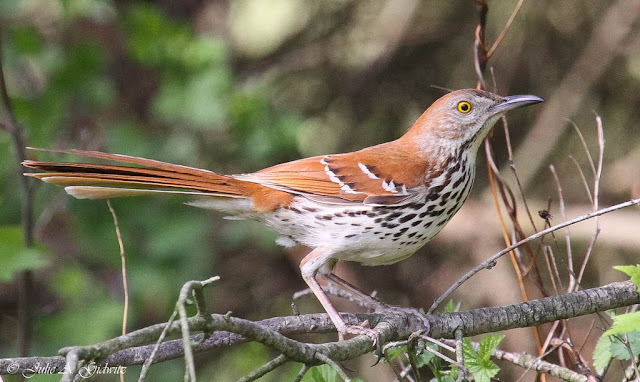 Below I feature several of the beautiful birds seen this summer on our country property. These beauties have been seen singing from the treetops and also snacking on mulberries and inchworms. 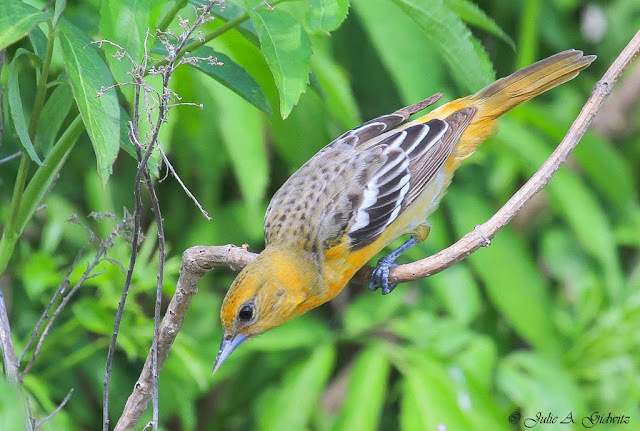 We are fortunate to have two pair of gorgeous orioles visiting our property this year. One couple is currently raising a hungry brood in a very large sycamore tree. The young birds should leave the nest sometime this week. Over the past few weeks, striking waxwings have been gobbling up various berries from the trees. I most often see these handsome birds feeding in the grass. I believe we have at least three couples that reside on our land. 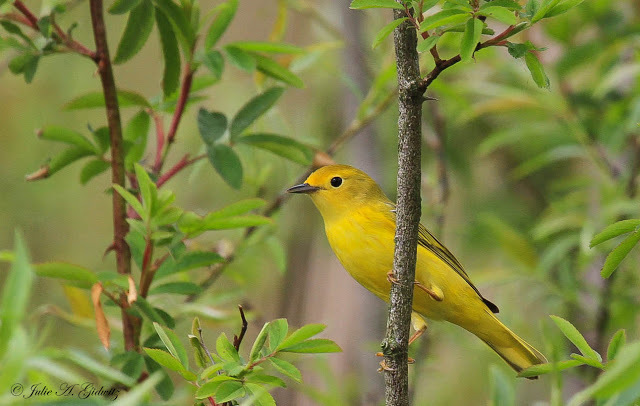 Many of these radiant warblers spend the summer in the marsh area of our property. They also enjoy searching for insects in our locust tree grove. This particular catbird is especially loquacious. It can be heard singing from dawn to dusk perched atop fir trees. Comical gurgles, squeaks and whistles of catbirds can be heard everywhere on our property. These brilliant birds are regulars at our thistle and sunflower seed feeders. 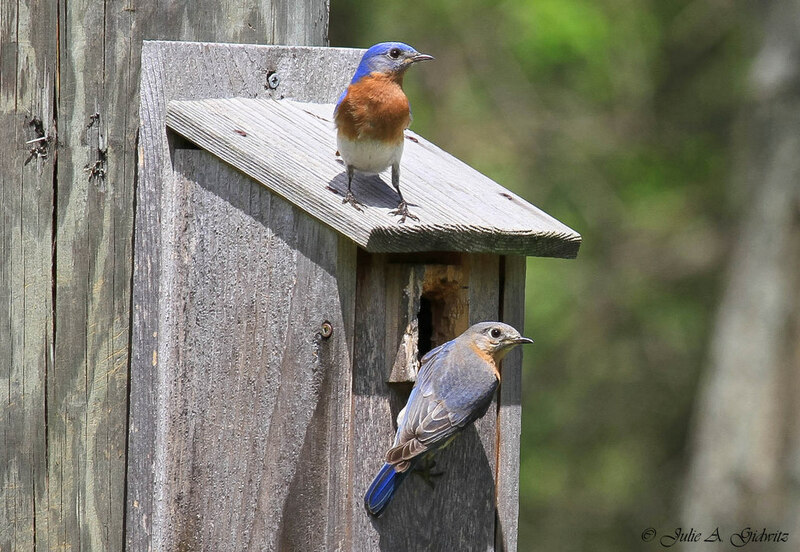 This summer, these diminutive birds have raised several broods in a few of our bluebird nest boxes. 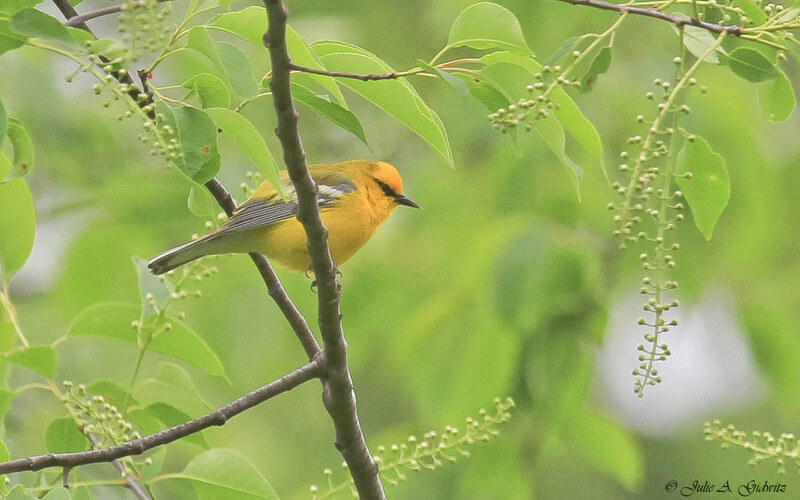 The summer of 2013 is the first time I have ever noticed a Blue-winged Warbler on our property. 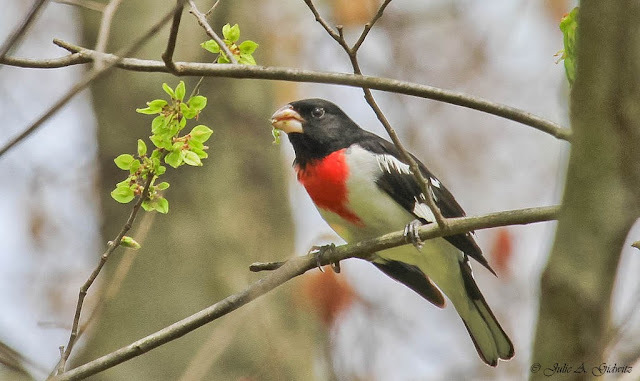 This handsome fellow seems to answer the calls of various other birds in the area by emitting a raspy buzzing sound all day long. 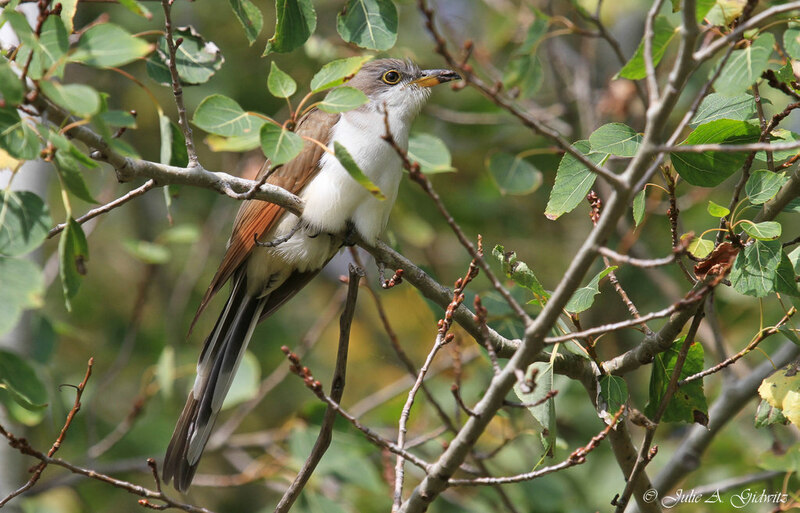 I was surprised an delighted to see a slow-moving Yellow-billed Cuckoo two weeks ago. It was the first sighting of a cuckoo on our acreage. 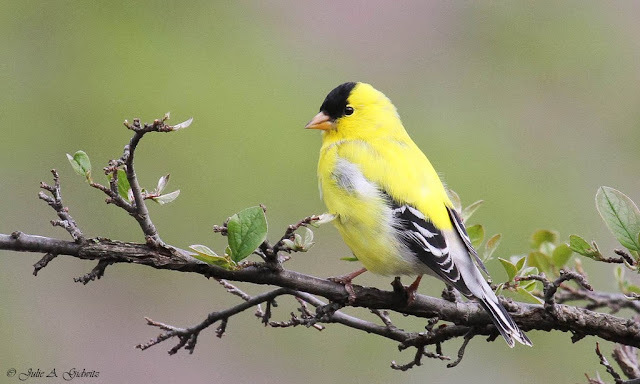 I see these handsome birds feeding in the trees and also dining on sunflower seeds and suet. 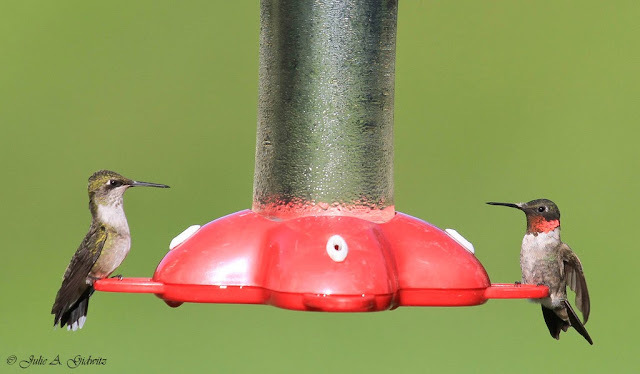 These tiny birds can bee seen feeding and battling for feeder possession all day long. We have so many hummingbirds on our property that it is too difficult to get a count. This beautiful pair have already successfully raised one brood. They recently had to relocate because a House Wren couple took over their previous nest box. Here they are checking out a different residence. They must have liked what they saw because the female bluebird is currently sitting on eggs inside her new abode. 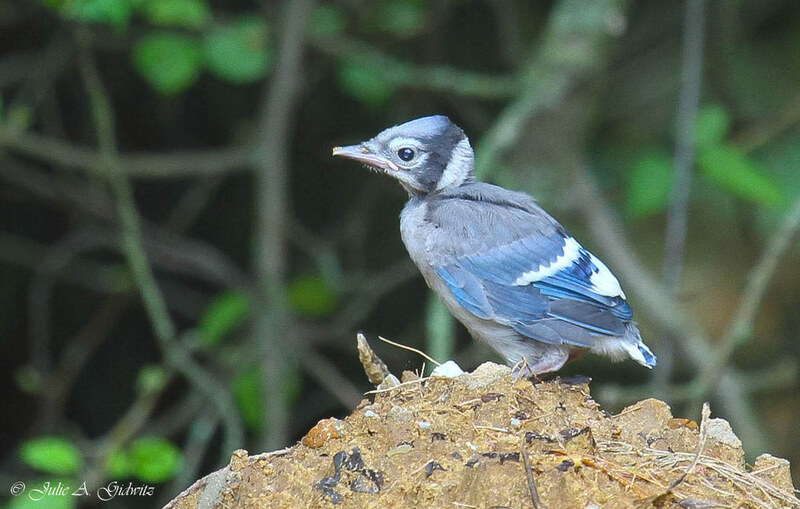 This photograph was taken just minutes after the young jay left the nest for the first time. It had difficulty flying and dropped to the ground. It soon hopped up to the top of a sand pile and then jumped onto a pine branch. You have beautiful birds there! Wonderful pictures! Really enjoyed the wind blown wren view. Stunning photos, as always, Julie! 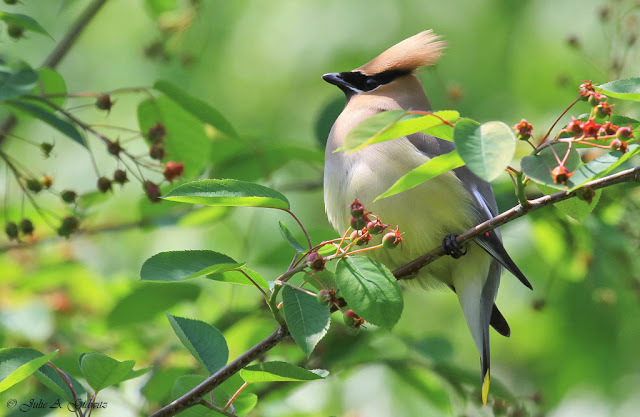 Your property looks like a bird lovers delight! The baby Blue Jay is precious! All of them are beauties! 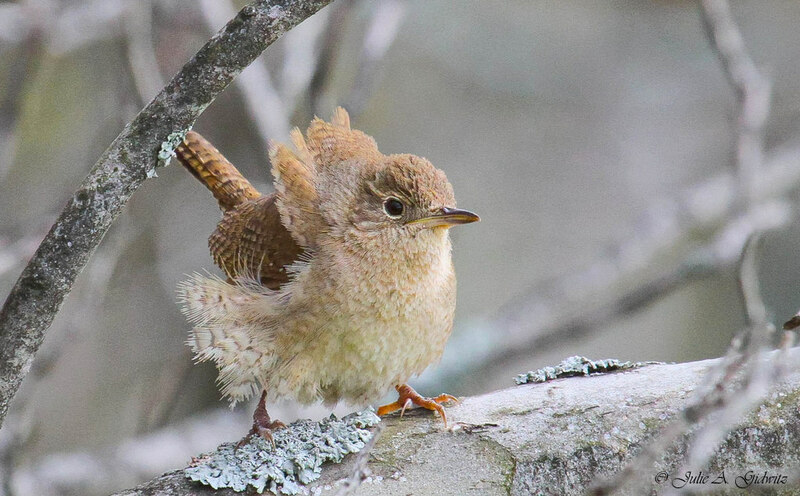 I especially love the windblown wren. :) Great work as always, Julie! Oh my goodness .... they just make my heart sing!!! That baby blue jay is so adorable! Julie, you have a wonderful variety of birds on your property. 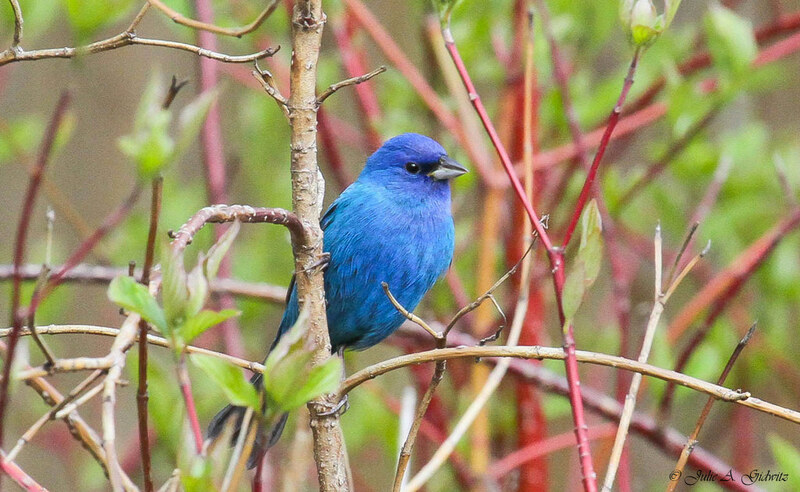 I would be happy birding around your place! Wonderful photos. Have a happy 4th of July! Gorgeous shots! That House Wren is precious, and I'm so jealous of your Blue-winged Warbler! I've only seen one once, and my photo didn't come out nearly that well.